Dunster is a quaint old village that lies in a beautiful setting on the northern edge of Exmoor. Its name derives from dun (ridge of hills) and torre (a fortified tower). From Saxon times the village was a centre for the local wool trade and the nearby Dunster Haven (which at that time was much closer to the coast) was kept busy with the export of local products. Dunster's wide main thoroughfare is overlooked by a magnificent Castle and at its centre is a lovely 17th-c Yarn Market, built by George Luttrell. The Luttrell family owned the village for some 600 years, up until 1950. This is the main reason it has remained unspoiled and unchanged over the centuries. The main street is lined with medieval stone built houses and old coaching inns, some of which date back to the 13th-c. Many of these buildings have now been transformed into quaint little shops and tea rooms. The village is a very popular destination for tourists and is well supplied with restaurants and pubs. 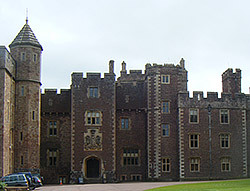 Other notable buildings are the Priory Church of St George, the Nunnery, Dunster Mill, the Dovecote and the Priory barn, which once belonged to Dunster Priory. At the southern edge of the village is the ancient medieval Gallox Packhorse bridge, spanning the river Avill. 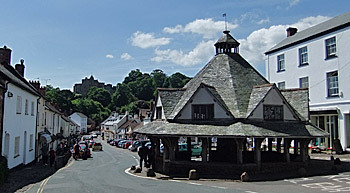 Dunster is said to be the birthplace of Cecil Alexander's "All Things Bright and Beautiful", a nearby heather-covered hill suggesting the "purple headed mountain" found in the hymn. This interesting 17th century octagonal timber-framed market hall was once the centre-point of Dunster's thriving cloth trade. The building is the first thing you notice when you arrive in town as it stands in a prominent position on the main street. The building was constructed by the Luttrell family to shelter the traders and their wares from the elements. The building has a hole in one of the roof beams caused by cannon fire during the Civil War. It is owned by the National Trust and normally open to view. This rugged red sandstone fortress sits high on a tor, dominating the town of Dunster. Little remains of the original Norman structure except for the 13th-c. gatehouse. The present building results from a reconstruction in 1617 and the later addition of fine plaster work ceilings and the impressive main staircase. The Victorians added the towers and turrets that give it its present story-book appearance. The castle was owned by the Luttrell family from the late 14th-c. and remained in the family until it was given to the National Trust in 1976. The Castle's splendid terraced gardens host a range of sub-tropical plants, including yuccas, mimosas and palms that lead down into 28 acres of beautiful parkland. The village Memorial Hall houses this interesting collection of over a thousand dolls. Said to be the West Country's finest working water mill. The mill, built in 1680, is located beside the River Avill, close to the High Street. Inside the mill you can watch how the wheat grain is milled into flour and bagged ready for sale. At the Mill Shop wholemeal flour and home-made muesli can be purchased, while coffee and light lunches are available from tea room and riverside garden. This popular Beach at the mouth of the River Avillis just half a mile (1 km) from the village. Dunster Haven once stood here but there are no signs of it today. The beach is a long stretch of sand and shingle, overlooked by Conygar Hill. The wooded summit of which is crowned by a folly tower. At Dunster station, just 20 minutes walk from the village, you can take a steam train that runs along a picturesque stretch of the old Great Western Railway, from Minehead to Bishops Lydeard and back.